It seems I am well equipped for hand-spinning. Last weekend, I finally unpacked the boxes that held my wheels and other tools. 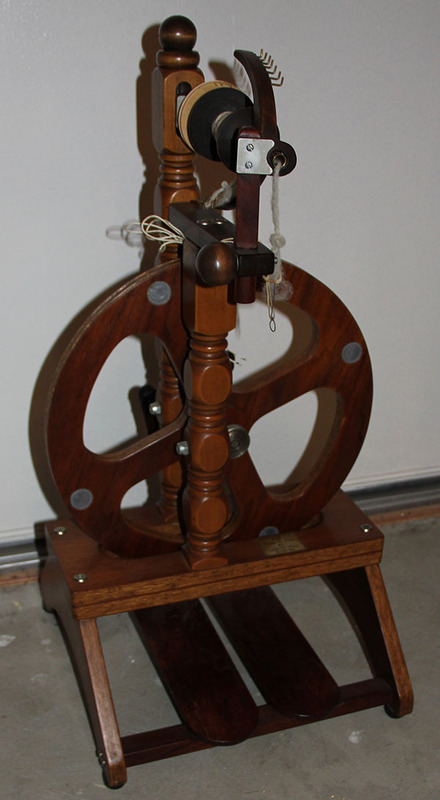 This is the wheel my grandfather rebuilt for me years ago when I first became interested in spinning. Someone in my grandmother’s guild was selling it, in need of a few repairs. I believe it was made in New Zealand. Despite having only one pedal (slightly trickier to use than double pedal wheels), it spins like a dream when it’s been properly adjusted. I need to put another leather thong on the pedal before I can use it. I also have one of my grandmother’s wheels. Yeah, I probably don’t need two spinning wheels. 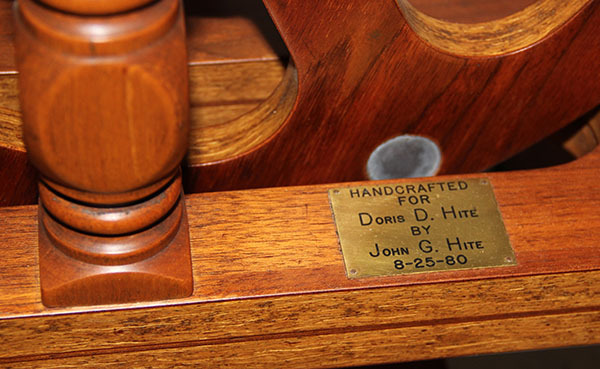 But this one was custom built for her by my grandfather. It seemed like it should stay in the family. And the action is very different, thanks in part to the double pedals and compact shape. I need to repair the string that wraps around the wheel and makes it go. 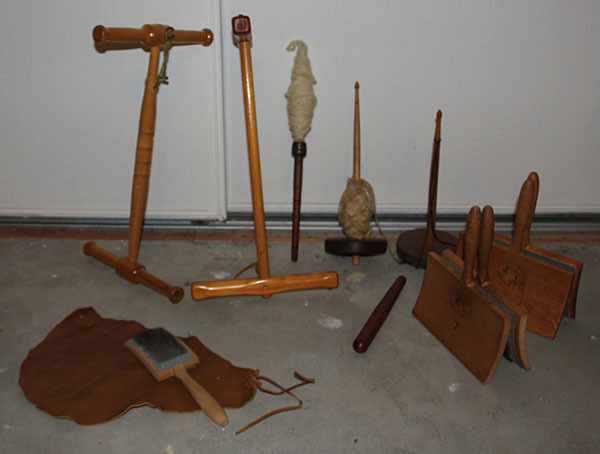 Lest you think that a spinning wheel can stand alone, here’s a sampling of my other spinning tools. The two cross-like items on the left are called niddy-noddies. You wrap freshly spun yarn around them to set its twist and make a skein. One is mine, the other was Gram’s. 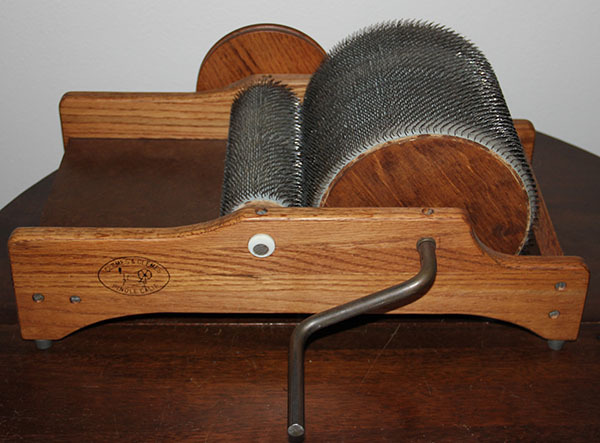 There’s a selection of drop spindles — used to spin yarn without a wheel. My mother (whose interest in needlework is relatively limited, but intensely creative) says they are most effective when dropped off the balcony of a three story building. I’ve also got two sets of hand carders, mine and Gram’s. And Gram’s tiny carder, along with a leather shield to protect your lap from flying carders. I’m cleaning and organizing my sewing room/studio. And boy is it a gargantuan task. There are things here that have been hoarded for generations. Literally. I’m letting a lot of things move along (think purple polyester knitted fabric from the 1970s and piles of neon eyelash yarn). There are also some amazing treasures that I’d forgotten I had. 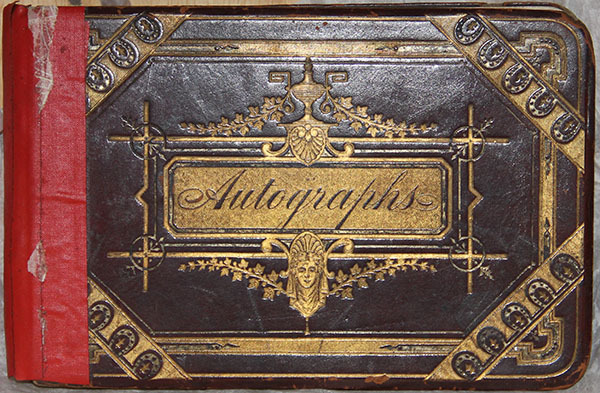 This autograph book belonged to my great-grandmother, Carrie Daugherty, neé Yonker. It’s fragile pages are filled with ornately penned poems and remembrances, some dated as early as 1879. I can recall sitting in my own grandmother’s sewing room, watching her turn the pages and listening to family stories. The same box also contained a wealth of photographs from the first half of the 20th century, lots of old letters, and a bible that belonged to my great-grandmother’s great-aunt (born in 1812), bearing an inscription dated 1832. Of course, the bulk of what I’m sorting through is fabric, yarn, and various needlework tools. Oh, and a fair slice of my grandmother’s wardrobe from 1930s through 1970s. But that’s another post entirely. 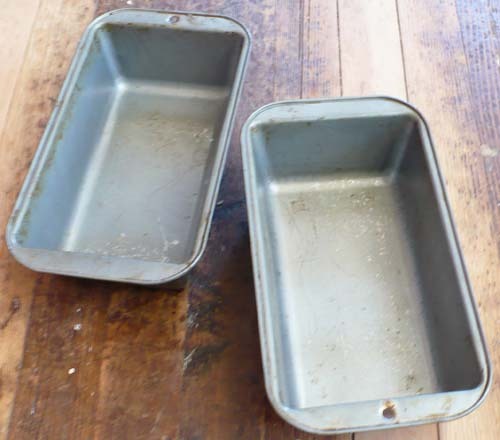 A few years ago, while I was researching the shape and size of mid-19th century bread loaves for a museum display, my grandmother sent me her own mother’s (my great-grandmother’s) bread pans. 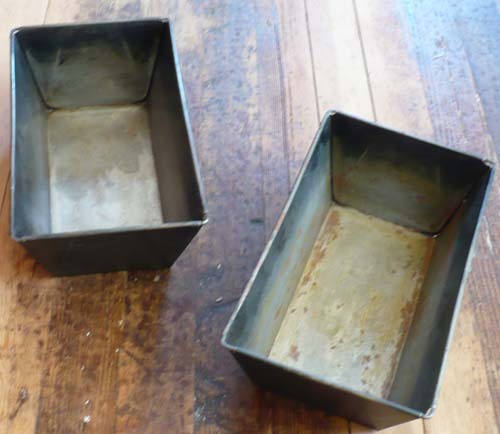 They’re tin, and liable to rust if not dried properly after washing. Notice how they are formed from sheets of metal folded over a rectangle of thick wire — you can really see it at the corners where the wire is uncovered. If my great-grandmother got them new, they’re about 100 years old. But of course, she may have inherited them herself! 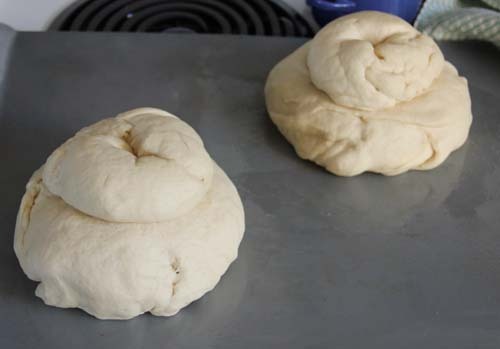 Notice the difference in pan size though! 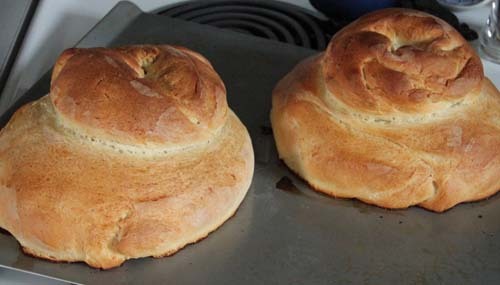 My modern pan (on the right) isn’t small by today’s standards. They weren’t kidding about their bread back then. I’m running out of things to say about aprons. Today’s pairing features stylized flowers — they scream 1950s to me, but they could also be from the 1970s, when 1950s style saw a resurgence (think Happy Days, Grease). 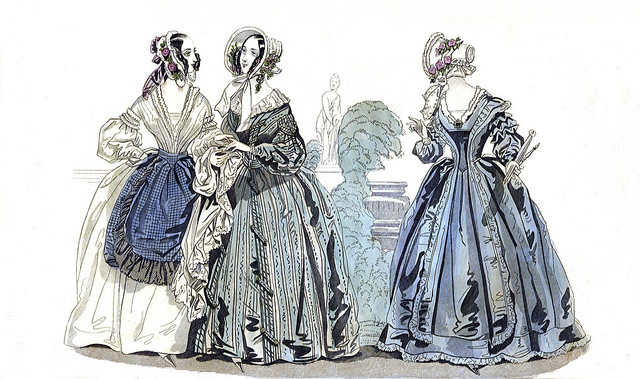 Number one is pretty basic, relying on the printed fabric for decorative effect. And a more elaborate apron of geometric daisies with red trim and patch pockets.